Waste management is a critical part of preparation for and response and recovery following homeland security and smaller incidents. These may include an act of terrorism involving chemical, biological and radiological agents, a large-scale natural disaster or an animal disease outbreak. This site provides public and private emergency planners, managers and responders with all-hazards information they can use to increase their communities' resiliency to these incidents. EPA published its update to the Planning for Natural Disaster Debris guidance. Please visit our web page for more information and to view the guidance. Waste management includes waste staging, sampling, characterization, packaging, transportation, reuse, recycling, treatment and disposal. 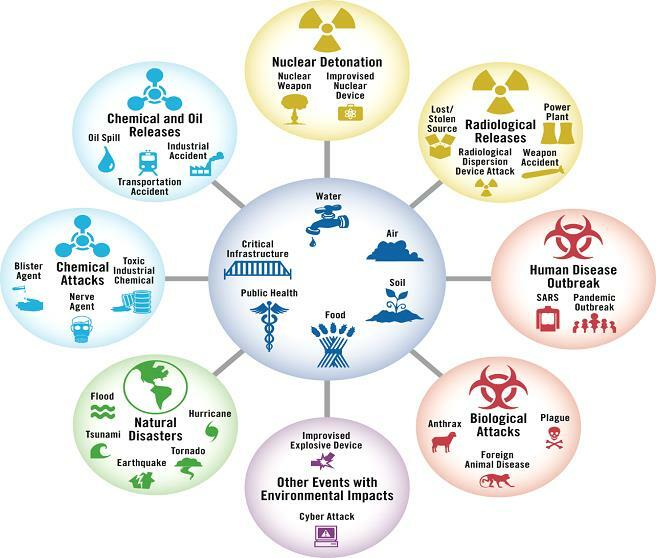 This graphic shows that different hazards have similar affects on the environment. Thus, emergency officials should plan for all hazards.